To dance is to discover and to recreate, above all when the dance is the dance of love. It is the best mode of knowledge. I have danced with the spider. I have cut a caper with the dancing mad god. Some things were worth the dance with danger. Unfortunately, diplomacy was a dance I needed to learn. Dance can become prayer and prayer can become dance. My earliest memory is of sitting at Mum’s dance school, watching her teach a ballet class. All cultures through all time have constantly been engaged in a dance with new possibilities of life. I’m a huge Kentucky fan. So when there was a chance to do the John Wall dance, I went into character. As far back as I can remember, I wanted to dance, sing and perform. We no longer sing and dance. We don’t know how to. Instead, we watch other people sing and dance on the television screen. Christmas, which was once a festival of active enjoyment, has turned into a binge of purely passive pleasures. My favorite time to dance is at, like, wedding receptions, when it’s all ages and everyone seems to be having fun. I think when dance is mediocre, it’s painful. But when dance is really impressive, it destroys. I love the ‘So You Think You Can Dance’ show. I love it. I think it’s some of the best hours on TV. There’s only so much you can do with a male voice in dance music. For me, writing a novel is like solving a puzzle. But I don’t intend my novels as puzzles. I intend them as invitations to dance. I feel that the music that I do is somewhat of a lost art and it’s not as popular as dance or pop music and people are not as interested in it. But it’s something that I believe in and I feel that it’s needed, so that’s why I do it and I will keep doing it until everybody hears it and gets it. Growing up, my sisters were both into dancing, so I went to a lot of dance recitals, mostly because there were always pretty girls in leotards. 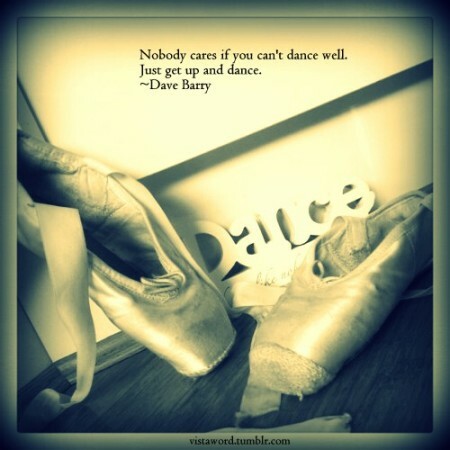 I learned to love dance for its own sake.